The Strudel is a pastry with a sweet or savory filling rolled up in a very thinly stretched dough. The name "Strudel" means Whirlpool since the dough is rolled and the center of the pastry resembles a whirlpool. 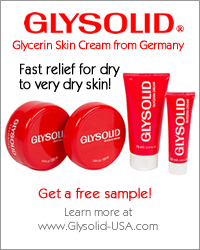 Traditionally, Strudel dough is made from scratch out of high-gluten flour, water, and oil. Preparing the dough is manually intensive. It requires an intense kneading period to develop the gluten strands, followed by a resting period for the dough (and the baker!). This gives the dough the elasticity it needs to be stretched into a very thin sheet - so thin that it is almost transparent. Easier recipes replace this process by substituting the traditional dough with a ready-made phylo-dough or puff-pastry dough. The most well known Strudel is the Apple Strudel. However, both sweet and savory Strudels exist in German cooking. Some of the most popular Strudels are described below, but the number of variations are endless ... limited only by the creativity of chefs both in Germany and around the world. Apple Strudel is a specialty of Austria and Bavaria (Bayern) and it is known worldwide. Its filling is made from chopped apples, cinnamon, raisins, and roasted bread crumbs. Other ingredients could include nuts (such as almonds or walnuts) and rum, depending on the recipe. The filling is spread out over the Strudel dough, which is then rolled up into a log. It is baked in an oven until golden brown and the ends become crispy. The Apple Strudel is best served warm, fresh from the oven. It is usually eaten with vanilla ice cream, whipped cream, or a vanilla sauce. This Strudel is filled with poppy seeds, apples, raisins, powdered sugar, and milk. 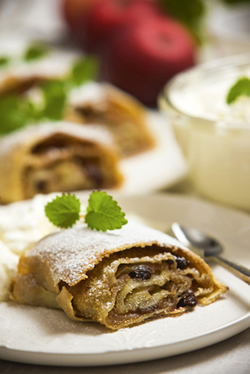 This Strudel is filled with Quark, butter, powdered sugar, raisins, semolina, eggs, and sour cream. The filling for this Strudel is made from ground walnuts, sugar, and whipped cream. Apples, pumpkin, powdered sugar, raisins, nuts, and cinnamon make up the filling for this Strudel. This Strudel is a specialty of the Palatinate (Pfalz) region. It is made from a Potato-Strudel dough and filled with bacon, Sauerkraut, and Blutwurst (Blood Sausage). This Strudel is filled with white cabbage, salt, pepper, and sugar. Quark, butter, semolina, eggs, chopped dill, and sour cream make up the filling for this savory Strudel. The filling for this Strudel is made of carrots, celery, savoy cabbage, cauliflower, grated cheese, butter, and seasoned with salt, pepper, and parsley. The history of the Strudel dates back hundreds of years. It was made as an easy yet satisfying meal by the poor. However, it was the Turkish Baklava pastry, introduced into Austria in 1453, that laid the foundation for the Strudel. The Austrians first created the Wiener Apfelstrudel (Viennese Apple Strudel). Gradually over time, other Strudels with different fillings were created.